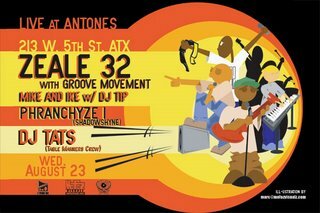 Short notice... but clear your calendars for Wednesday night the 23rd... which is sure to be a good show over at Antone's... Zeale 32 with Groove Movement, Mike and Ike with DJ Tip, Phranchyze, and DJ Tats! That's an awesome line up. Ya'll hit Whisky on Friday with Mike and Ike and Tats? Wasn't that sick? Oh yeah and then Romeo and Santos and the crew so nonchalantly strolled in and did their thang. Good times. This is a good week for Austin Hip Hop... hope everyone finds something to do!